“My baby boy was born with a part of his food pipe missing; what remained was intertwined with his windpipe. 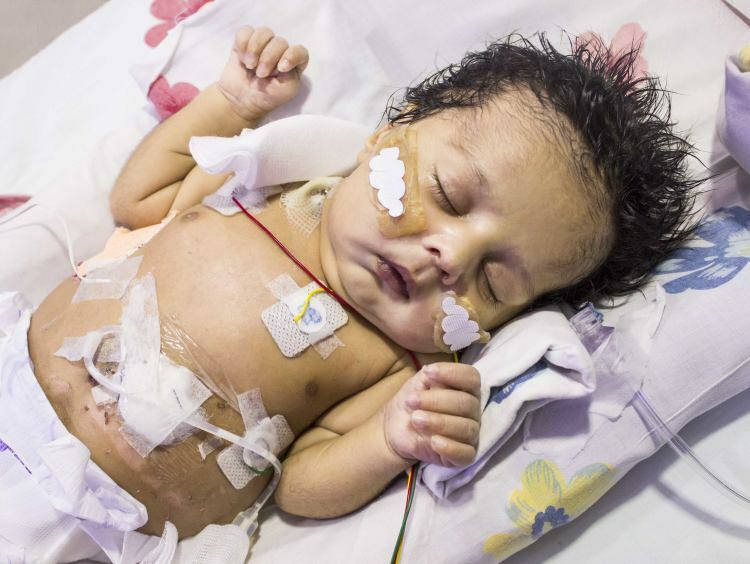 His condition was so critical that he had to have an emergency surgery within two days of his birth. We thought that would help him recover, but soon he started getting deadly infections. We have been to hell and back in the past few days; I had to sell the only piece of land I owned for a meagre sum, but even that is useless now. 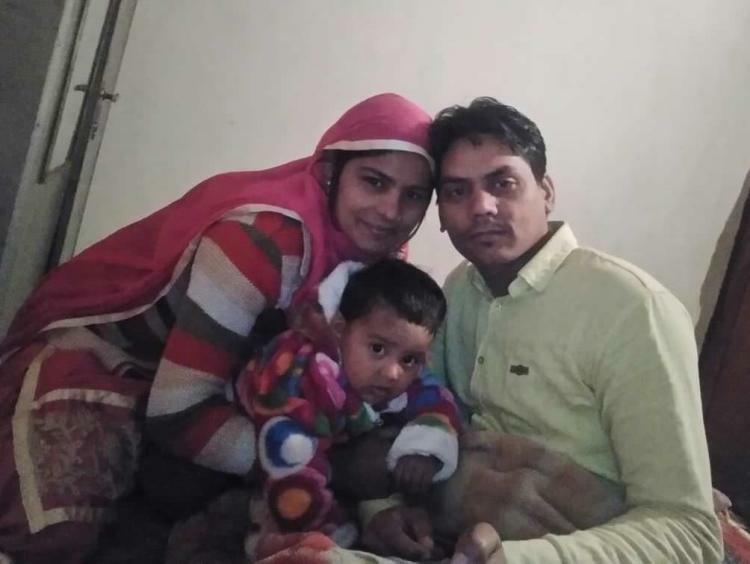 We need a lot of money to save our son but all financial options have closed for me.”-Ombir Singh, father. 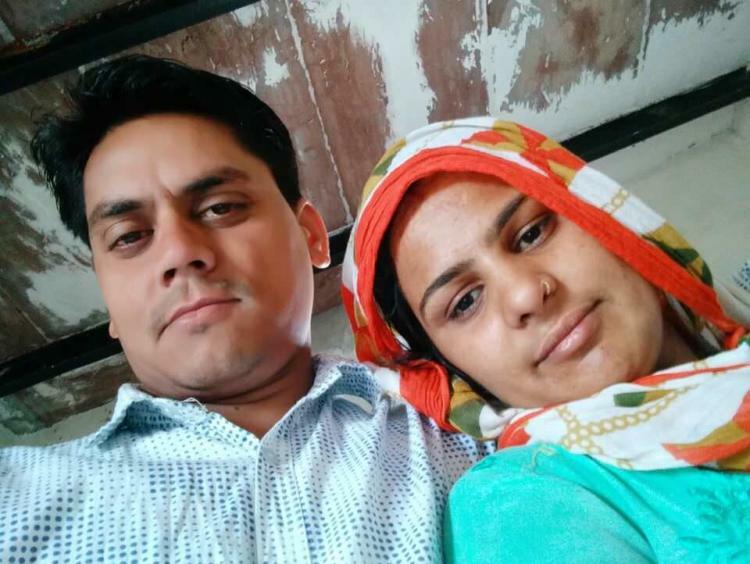 Ombir and Sangeeta live in Palwal district of Haryana, where advanced medical facilities do not exist. Their baby boy was born in a government hospital, just like his older siblings. 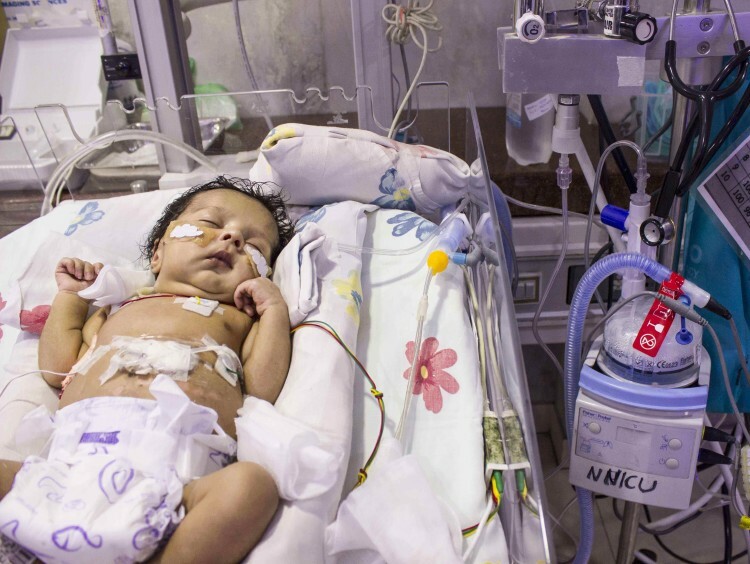 He had to be shifted to Delhi soon after his birth because he was not able to feed or breathe properly. “His condition was so bad. To see your newborn struggling is a very difficult sight for a parent. 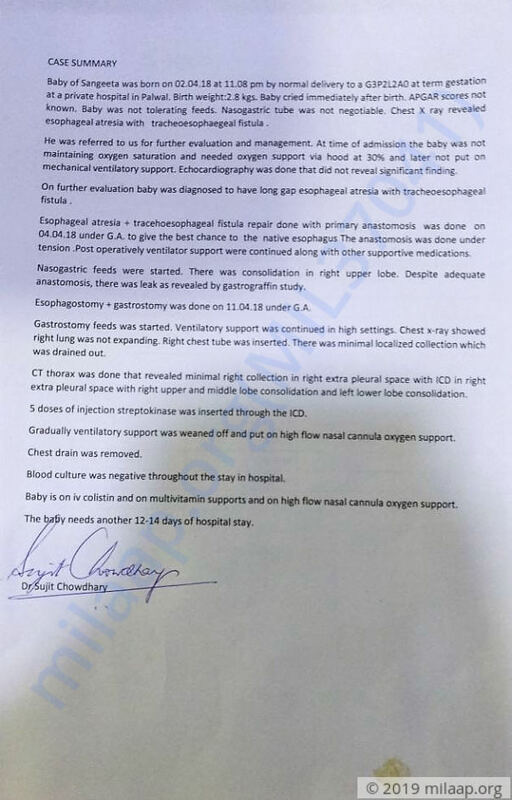 I work in Faridabad, so I collected some funds from whoever I could and we took him to a good hospital in Delhi where they performed an emergency surgery to separate his wind pipe and food pipe. I hold a BPL card (Below Poverty Line) so I knew it would be impossible for me to afford a private hospital but I had no choice. 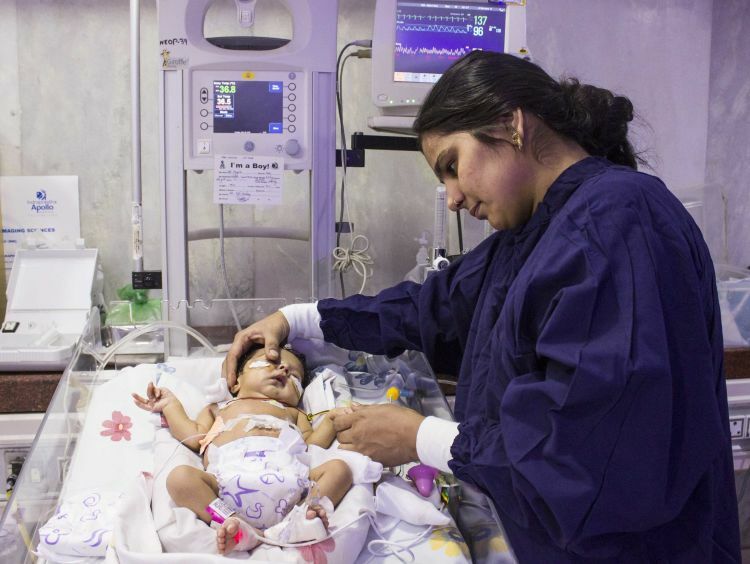 My baby required advanced care that was only available in Delhi.”-Ombir. “I was waiting outside the operation theatre for some good news. I was so naïve that I thought everything would be fine after just one surgery. Perhaps the father in me had that hope which kept me going. But when the doctors told me that he was getting worse, I completely broke down. My wife, Sangeeta, was with me so I didn’t cry. She was also on the verge of bursting out into tears so I kept my cool”-Ombir tears up. Sangeeta had a normal delivery but she has not been able to rest like new mothers. Her biggest regret is that she was not able to feed her son even one drop of breastmilk. She doesn’t know when she will be able to scoop up her bundle of joy in her arms because he is still struggling to breathe and feed in the ICU. “I don’t go to the hospital much now. When I see him encased in all those equipment and being fed through a plastic tube outside his belly, I curse myself. He didn’t do anything wrong to deserve this. Anxiety is killing me so my husband does not take me to the hospital all the time. Money is another factor; he has told me that instead of spending money on my travel, we can use that for our baby’s treatment. We are trying to save every paisa now, but don’t know how much that will help.”-Sangeeta, mother. Their baby boy has been in and out of the ICU for about a month now. He is still in a critical condition, but doctors have hope that he will do well after two weeks more of hospital care. “His lungs are slowly getting better and there is hope that he will be alright. I know in my heart that he will be fine. I wish I had something to sell and get the full money for his treatment, but unofrtunately I don’t. My kind friends and relatives have helped me so far, but we still need a lot of money. Nowadays, I have stopped taking leave from my workplace because I cannot afford to. When I go to work, it is my elder brother who stays at the hospital. It is a very difficult time in our lives; I hope we are able to sail through this."-Ombir. Ombir works as an accounts assistant in a small private firm in Faridabad and makes around Rs 10,000 a month. He has two older children (girls aged 4 and 2 respectively) who he needs to take care of. He had no choice but to sell his ancestral property for Rs 30,000 rupees to pay some bills at the hospital. 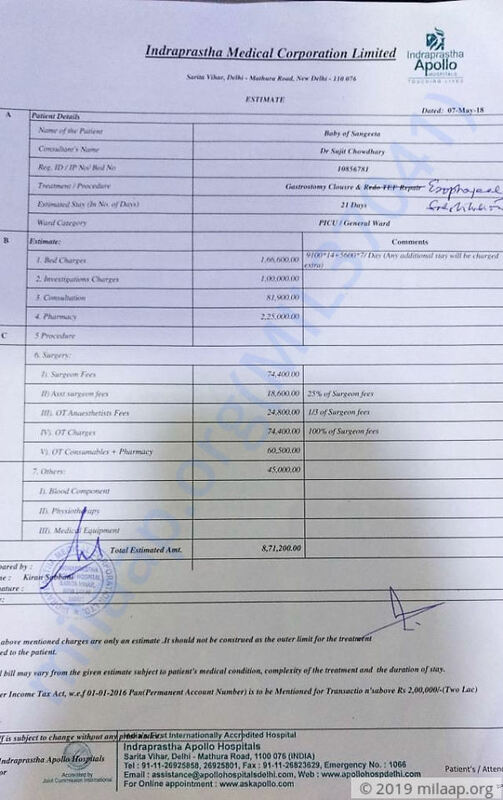 He has borrowed around Rs 4 lakhs for his baby’s treatment already. But now, he needs more than Rs 8 lakhs to take him back home healthy. Thank you for the wonderful support that you have shown towards Sangeeta's baby. She is doing well and is at home. The doctors have suggested that the final surgery will be in November. This may be preponed or postponed based on her health. Please pray for baby's health and speedy recovery. Currently, the baby is at the hospital and doing fine. He has responded well to the treatment and is showing good signs of improvement. 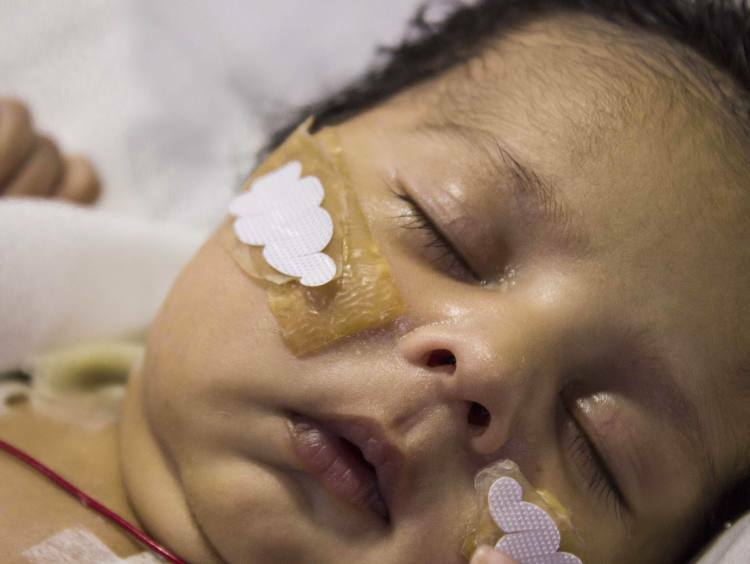 The baby is able to breathe properly without the ventilator support and is now in the normal ward. He will be closely monitored by the doctors and most probably get discharged within 10-14 days.